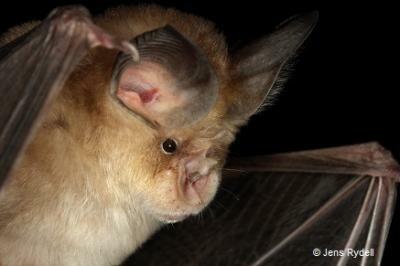 The Mediterranean Horseshoe bat is medium-sized (wingspan 300-320 mm) with grey/red-brown fluffy fur. Its ears and membranes are light grey and its connecting process is slighty pointed and bent downwards. Similarly to R. blasii, it occurs in the Mediterranean basin and is associated with limestone areas. Underground sites and occasionally cellars and roofs are selected as summer roosts; on the other hand, caves with a constant microclimate are chosen for winter roosts. R. euryale can not only hunt in open forests but also in dense vegetation due to its agile flight manoeuvers. Its diet comprises of small moths, crane-flies and small beetles, which it catches mostly while in flight. Although more research still needs to be conducted, this species appears to be sedentary, with roosts located around 50 km from each other. R. euryale is distributed in the Mediterranean area from northwest Africa over most Mediterranean islands (except the Balearics and Crete), throughout the Iberian Peninsula, southern France, Italy, the Balkan peninsula, Slovakia, Hungary, Romania and the western parts of Asia Minor. It also occurs in the Near East (Iran, Iraq and the Caucasus area). Threats include the disturbance of underground roosts (e.g. cave tourism), loss of foraging habitats, use of pesticides in (riparian) forests, as well as habitat fragmentation.